Archive » They are giants, We are Millions: an Industrial Livestock Breeder in Mexico Closes. A story with a happy ending in the fight against environmental crimes and the violation of indigenous rights. For centuries the indigenous Maya people have lived in the area of Yucatan, which today is called the Cenotes Ring Nature Reserve, a unique hydrological system in the world. It is from here that a complex network of caves starts, giving life to underground rivers, water reserves and underground lakes, called cenotes, which supply the entire Yucatan with water and hosting a very large number of animal species. Recently, this protected area has been at risk of disappearing. Although it is also recognized by the Ramsar Convention, last year, local authorities authorized the introduction of an industrial herd of more than 49,000 pigs in the heart of the reserve, with enormously negative consequences for the ecosystem and the lives of those who live there. In addition to destabilizing the entire social balance of the area, the impact of industrial livestock farming on the environment – among countless other things – have proven to be serious, for example, the enormous and highly concentrated volumes of manure that pollute local aquifers. “The industrial breeding in the reserve was not a novelty” explains Aliza Mizrahi, Slow Food Convivium Leader, “according to government development plans, the Yucatan peninsula has seen its vocation for livestock farming, particularly industrial livestock, grow by force, and the Yucatan state government is proud to be the main exporter of pork abroad through the Mexican Pig Farming Group. In fact, in 2009 alone, there were 479 pig farms in the region with 670,174 pigs and 185 poultry farms with 237,814 turkeys and 27 million chickens”. And the numbers have continued to grow over the years. “The consequences of these figures are very serious, for various reasons. But one of the main concerns is the groundwater: it catches all the waste produced by these farms, that is to say thousands of tonnes of matter that undermines the integrity of the entire ecosystem. Today, all groundwater is completely contaminated due to the huge number of farms in the area. Fortunately, people are beginning to realize the situation and are putting pressure on the government to cut down these huge farms, but the problem is much more serious and closing the farms is not enough to solve the issue. Many small-scale farms are now also using unsustainable farming systems and are becoming less and less concerned about animal welfare. That’s why, with the Slow Food network, we not only fight for the closure of large farms, but we also try to raise awareness and help small-scale producers, to improve their supply chains, so that they can really start to make a difference. In this regard, the Slow Food network and Greenpeace recently organized a forum dedicated to sustainable farming, exhibiting the best examples in Mexico, such as the Presidium of the Yucatan Peninsula Hairless Pig. Change in the Anillo del Cenotes reserve has already started to take shape. The indigenous Mayans, indeed, have not merely stood by and watched: the struggle for the closure of the farm began almost immediately and saw a gradual growth of allies, up until to the decision, thanks above all to the association INDIGNACIÓN, A.C., which has been defending and promoting human rights in the Yucatan peninsula for more than 25 years. This time, justice won: industrial livestock breeding has been closed, recognizing the right of indigenous peoples to decide on their territories. “The struggle has been going on for two years now” explains Lourdes Guadalupe Medica Carrillo, the lawyer who took on and won the case. “It was not easy: in our country, justice and judicial processes take a long time to be resolved and above all, in this case, the economic interests were very high, thus subjecting the indigenous people themselves to threats and risks. The situation was really too serious and the company, in addition to causing damage, has acted illegally, moving pigs in well before they had permits and without complying with international human rights conventions, or the Mexican Constitution itself, which make it mandatory to consult with indigenous peoples living in a territory before carrying out any project that has an impact on the lives of communities. Further, at an initial inspection, the farm did not have an adequate system for wastewater treatment. Even before they had any legal permission to be on the reserve, the pigs were already irreversibly contaminating the soil and the underlying aquifers, making the closure and removal of all animals immediate and urgent. 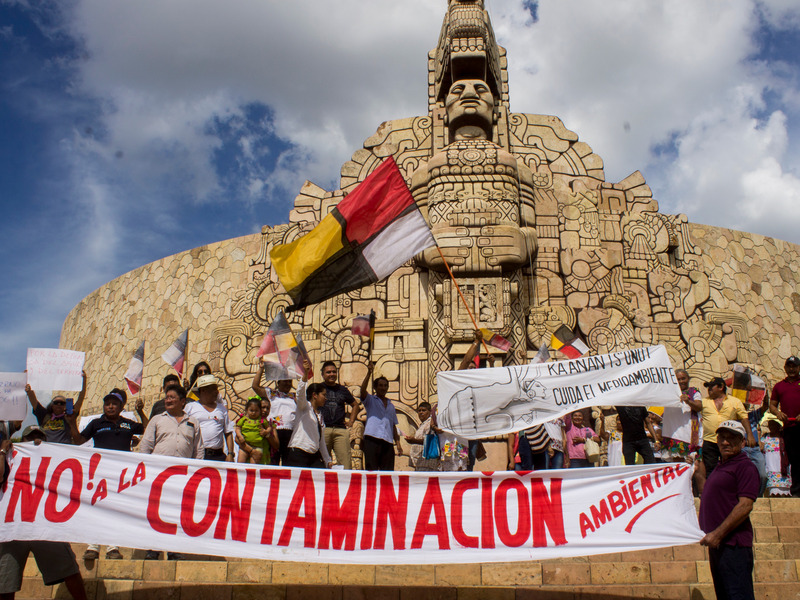 “The closure of this company has been a great success” concludes Carrillo, “First, because in our country there are very few cases in which a precautionary measure of such great impact is granted for the protection of the environment and indigenous rights. Second, in the State of Yucatan, the case has generated an analysis of the consumption and production of pork. Cases such as Homún have made people reflect on the negative impact that this form of production is having on the environment and on its future. Finally, it has given courage to the local indigenous peoples. 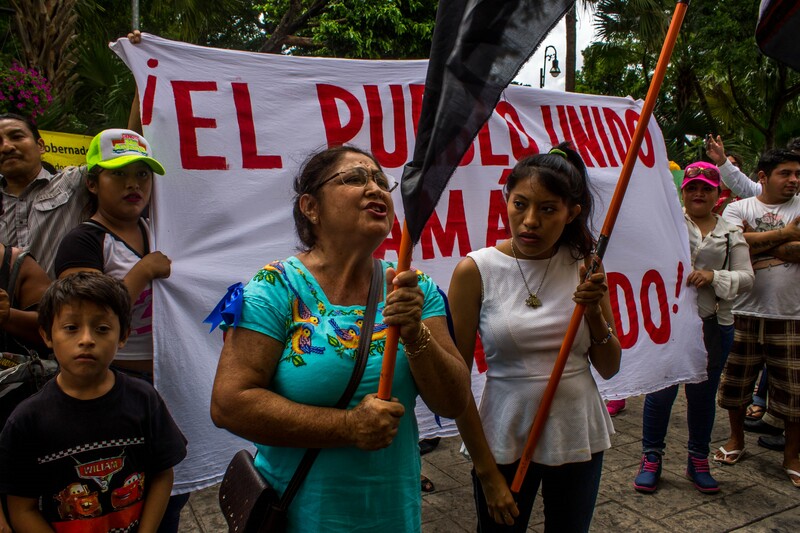 This is not an isolated example: in the Yucatan Peninsula there are several movements that help indigenous peoples to fight for their rights, such as the village of Kinchil which is locked in a similar fight against another pig farm. The advice is to get organized. The most important thing is a solid social basis that generates the defense of rights, territory and natural resources. Without fear of intimidation or threats, national and international civil society is interested in supporting indigenous struggles, but we must fight together! The network makes the difference: together we are stronger”.